Prepare Suddenly Salad™ as directed on box. Meanwhile, cook pasta shells in boiling water until al dente. Drain and set aside to cool. Dice the tomatoes, jalapeños and avocado and place in a bowl with drained pasta salad. Pour prepared sauce over pasta and stir well to combine. 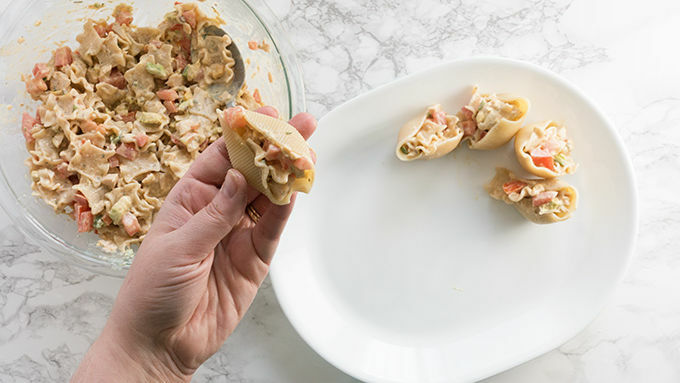 Spoon pasta salad into cooled pasta shells. Crush the Suddenly Salad™ topping and sprinkle over the stuffed shells. Top with crumbled Cotija cheese. Large pasta shells filled with Mexican-seasoned pasta salad. Party on. If there are two things that are universally loved, they are Mexican food and pasta. Right? So, I make it my mission in life to bring those two loves together as often as possible. It might not be traditional, but it is darn delicious and I’ve yet to hear anyone complain about one of my Italian-Mexican hybrid recipes. And that’s why we’re here today. A fusion of flavors. 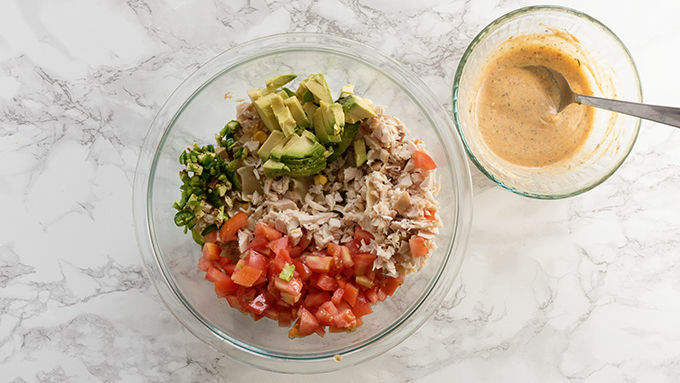 Pasta salad amplified with corn, black beans, avocado, tomato, and some shredded chicken. Don’t forget to sprinkle a little Mexican Cotija cheese right on top for flair. 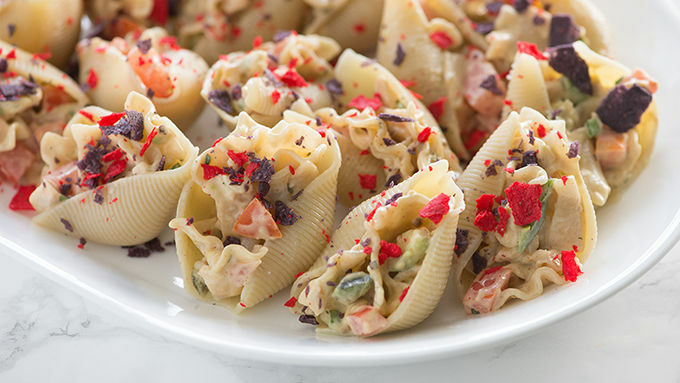 Oh, and did I mention that this pasta salad is then stuffed inside big pasta shells? 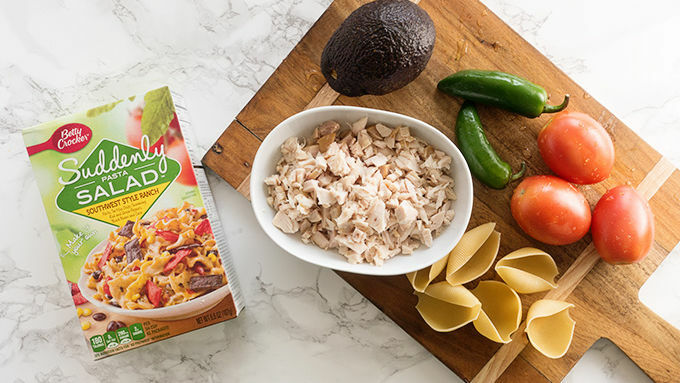 Party food perfection.You’ll need some Suddenly Salad pasta salad to start -- the Southwestern Ranch variety is great for this recipe. 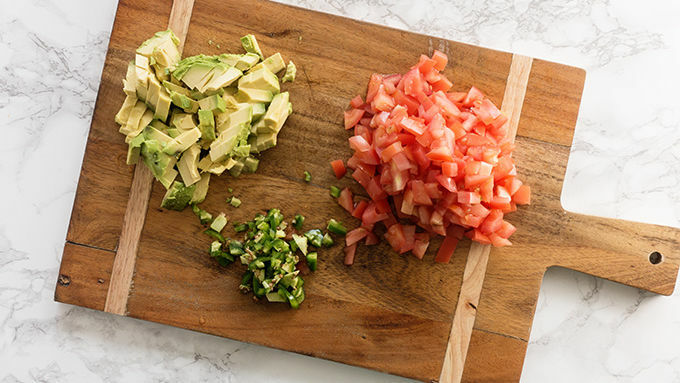 Then we’re going to load that up with chicken, tomatoes, jalapenos, and avocados. The sauce that comes in the Suddenly Salad box is divine. It tastes like creamy Nacho Cheese tortilla chip sauce. I really loaded the pasta salad up with extra goodies, so no need to worry that this is overwhelmingly pasta-y. It’s just overwhelmingly good. Grab the package of crunchy tortilla chip topping that came in the Suddenly Salad box and smash it all up. Sprinkle it over the top with some Cotija cheese and then serve ‘em up!